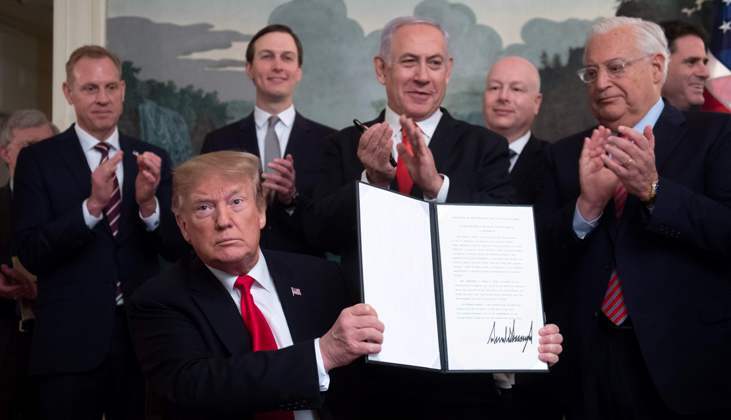 With Prime Minister Benjamin Netanyahu at his side, US President Donald Trump declared Monday that the Golan Heights belongs to Israel -- handing another major diplomatic victory to the premier ahead of tight elections. Trump was isolated in the move, with the United Nations and US allies France and Britain all saying that they still considered the Golan Heights ‘Israeli-occupied’ in line with UN resolutions. Russian foreign ministry spokeswoman Maria Zakharova said that Trump’s declaration ‘ignores all international procedures’ and "’ould drive a new wave of tensions’ in the Middle East. Syria denounced the ‘blatant attack’ on its sovereignty, while Turkish Foreign Minister Mevlut Cavusoglu criticized Trump for giving ‘virtually an election gift’ to Netanyahu.